The Maginot Line (French language: Ligne Maginot, IPA: [liɲ maʒino]), named after the French Minister of War André Maginot, was a line of concrete fortifications, obstacles, and weapons installations that France constructed along its borders with Germany during the 1930s. The line was a response to France's experience in World War I and was constructed during the run-up to World War II. A similar line of defenses, called the Alpine Line, faced Italy. While the fortification system did prevent a direct attack, it was strategically ineffective, as the Germans invaded through Belgium, outflanking the Maginot Line. The German army ran through the Ardennes forest and the Low Countries, completely sweeping by the line, defeating the French army and conquering France in about six weeks. As such, reference to the Maginot Line is used to recall a strategy or object that people hope will prove effective but instead fails miserably. It is also the best known symbol of the adage that "generals always fight the last war, especially if they have won it". The Maginot Line was impervious to most forms of attack, and had state-of-the-art living conditions for garrisoned troops, air conditioning, comfortable eating areas and underground railways. However, it proved costly to maintain and subsequently led to other parts of the French Armed Forces being underfunded. The defences were first proposed by Marshal Joffre. He was opposed by modernists such as Paul Reynaud and Charles de Gaulle who favoured investment in armour and aircraft. Joffre had support from Henri Philippe Pétain, and there were a number of reports and commissions organised by the government. It was André Maginot who finally convinced the government to invest in the scheme. Maginot was another veteran of World War I; he became the French Minister of Veteran Affairs and then Minister of War (1928–1931). Part of the rationale for the Maginot Line stemmed from the severe French losses during the First World War, and their effects on French demographics. The drop in the national birth rate during and after the war, resulting from a national shortage of young men created an "echo" effect in the generation that provided the French conscript army in the mid-1930s. Faced with inadequate personnel resources, French planners had to rely more on older and less fit reservists, who would take longer to mobilize, and would diminish French industry because they would leave their jobs. Static defensive positions were therefore intended not only to buy time, but also to defend an area with fewer and less mobile forces. In practice, France deployed about twice as many men, 36 divisions (roughly one third of its force), for defence of the Maginot Line in Alsace and Lorraine, whereas the opposing German Army Group C only contained 19 divisions, or less than one seventh of the total force committed in Fall Gelb. The line stretched from Switzerland to Luxembourg, and a much lighter extension was extended to the Strait of Dover after 1934. The original line construction did not cover the area chosen by the Germans for their first challenge, which was through the Ardennes in 1940, a plan known as Fall Gelb. 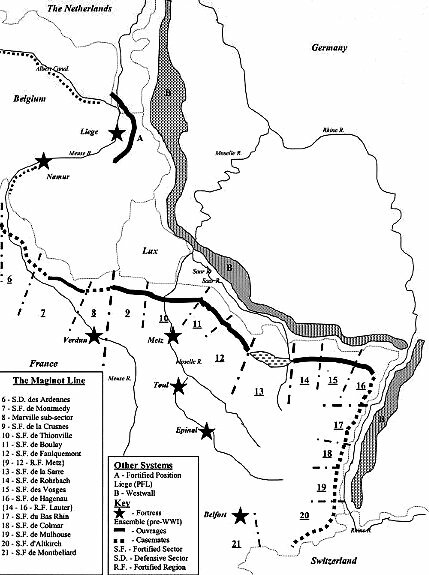 The location of this attack, probably because of the Maginot Line, was through the Belgian Ardennes forest (sector 4), which is off the map to the left of Maginot Line sector 6 (as marked). Although the name "Maginot Line" suggests a rather thin linear fortification, it was quite deep, varying (i.e., from the border to the rear area) from between 20 to 25 kilometres (12 to 16 miles). It was composed of an intricate system of strong points, fortifications and military facilities such as border guard posts, communications centres, infantry shelters, barricades, artillery, machine gun and anti-tank gun emplacements, supply depots, infrastructure facilities and observation posts. These various structures reinforced a principal line of resistance, made up of the most heavily armed ouvrages, which can be roughly translated as fortresses or major defensive works. Border Post line (1): This consisted of blockhouses and strong houses, which were often camouflaged as inoffensive residential homes, built within a few metres of the border, and manned by troops so as to give the alarm in the event of a sneak or surprise attack as well as to delay enemy tanks with prepared explosives and barricades. Outpost and Support Point line (2): Approximately 5 kilometres (3 miles) behind the border, a line of anti-tank blockhouses that were intended to provide resistance to armoured assault sufficient to delay the enemy so as to allow the crews of the "C.O.R.F. ouvrages" to be ready at their battle stations. These outposts covered major passages within the principal line. Principal line of resistance (3): This line began 10 kilometres (6 miles) behind the border. It was preceded by anti-tank obstacles made of metal rails planted vertically in six rows, with heights varying from 0.70 to 1.40 metres (2 ft 4 in to 4 ft 7 in) and buried to a depth of 2 metres (6 ft 7 in). These anti-tank obstacles extended from end to end in front of the major works across hundreds of kilometres, interrupted only by extremely dense forests, rivers, or other nearly impassable terrain. The anti-tank obstacle system was immediately followed by an anti-personnel obstacle system made primarily of very dense barbed wire. Anti-tank road barriers also made it possible to block roads at necessary points of passage through the tank obstacles. Infantry Casemates (4): These bunkers were armed with twin machine-guns (abbreviated as JM in French) and anti-tank guns of 37 or 47 mm (1.5 or 1.9 in). They could be single (with only one firing room in only one direction) or double (two firing rooms, in two opposite directions). These generally had two floors, with a firing level and a support/infrastructure level that provided the troops with rest and services (power generating units, reserves of water, fuel, food, ventilation equipment, etc.). The infantry casemates often had one or two "cloches" or turrets located on top of them. These GFM cloches were sometimes used to emplace machine guns or observation periscopes. They were manned by 20 to 30 men. Petits ouvrages (5): These small fortresses reinforced the line of infantry bunkers. The petits ouvrages were generally made up of several infantry bunkers connected by an underground tunnel network to which were attached various buried facilities, such as barracks, electric generators, ventilation systems, mess halls, infirmaries and supply caches. Their crew consisted of between 100 and 200 men. Ouvrages (6): These fortresses were the most important fortifications on the Maginot Line, having the sturdiest construction and the heaviest artillery. These were composed of at least six "forward bunker systems" or "combat blocks", as well as two entrances, and were interconnected via a network of underground tunnels that often featured narrow gauge electric railways for transport between bunker systems. The various blocks contained necessary infrastructure such as power stations with generating units, independent ventilating systems, barracks and mess halls, kitchens, water storage and distribution systems, hoists, ammunition stores, workshops, and stores of spare parts and food. Their crews ranged from 500 to more than 1,000 men. Observation Posts (7) were located on hills that provided a good view of the surrounding area. Their purpose was to locate the enemy and direct and correct the indirect fire of artillery from the artillery fortifications as well as to report on the progress and position of key enemy units. These are large reinforced buried concrete bunkers, equipped with armoured turrets containing high-precision optics that were connected with the other fortifications by field telephone and wireless transmitters (known in French by the acronym T.S.F.). Telephone Network (8): This system connected every fortification in the Maginot Line, including bunkers, infantry and artillery fortresses, observation posts and shelters. Two telephone wires were placed parallel to the line of fortifications, providing redundancy in the event of a wire getting cut. There were places along the cable where dismounted soldiers could connect to the network. Infantry Reserve Shelters (9): These were found between 500 and 1,000 metres (1,600 and 3,300 feet) behind the principal line of resistance. These were buried concrete bunkers designed to house and shelter up to a company of infantry (200 to 250 men), and had such features as electric generators, ventilation systems, water supplies, kitchens and heating, which allowed their occupants to hold out in the event of an attack. They could also be used as a local headquarters and as a base for counter-attacks. Flood Zones (10) were natural basins or rivers that could be flooded on demand and thus constitute an additional obstacle in the event of an enemy offensive. Safety Quarters (11) were built near the major fortifications so fortress ("ouvrage") crews could reach their battle stations in the shortest possible time in the event of a surprise or sneak attack during peacetime. High-voltage Transmission Lines (15), initially above-ground but then buried, and connected to the civil power grid, provided electric power to the many fortifications and fortresses. Heavy rail artillery (16) was hauled in by locomotives to predesignated locations so as to support the pre-emplaced artillery located in the fortresses, which was intentionally limited in range to 10–12 kilometres (6–7 miles). There are 142 ouvrages, 352 casemates, 78 shelters, 17 observatories and around 5,000 blockhouses in the Maginot Line. The most widespread are the GFM cloches, where GFM means Guetteur fusil-mitrailleur (machine-gun sentry). They are composed of three to four openings, called crenels or embrasures. These crenels may be equipped as follows: Rifle machine-gun, direct vision block, binoculars block or 50 mm (2.0 in) mortar. Sometimes, the cloche is topped by a periscope. There are 1,118 GFM cloches on the line. Almost every block, casemate and shelter is topped by one or two GFM cloches. The JM cloches are the same as the GFM cloches except that they have one opening equipped with a pair of machine-guns. There are 174 JM cloches on the line. There are 75 LG cloches (lance-grenade – grenade launcher) on the line. Those cloches are almost completely covered by concrete, with only a small hole to launch grenades through for local defence. There are 20 VP cloches (periscopic vision) on the line. These cloches could be equipped with several different periscopes. Like the LG cloches, they were almost completely covered by concrete. The VDP cloches (direct and periscopic vision) are similar to the VP cloches, but have two or three openings to provide a direct view. Consequently, they were not covered by concrete. The line included the following retractable turrets. The specification of the defences was very high, with extensive and interconnected bunker complexes for thousands of men; there were 45 main forts (grands ouvrages) at intervals of 15 kilometres (9.3 miles), 97 smaller forts (petits ouvrages) and 352 casemates between, with over 100 kilometres (62 miles) of tunnels. Artillery was coordinated with protective measures to ensure that one fort could support the next in line by bombarding it directly without harm. The largest guns were therefore 135 mm (5.3 in) fortress guns; larger weapons were to be part of the mobile forces and were to be deployed behind the lines. The fortifications did not extend through the Ardennes Forest (which was believed to be impenetrable by Commander-in-Chief Maurice Gamelin) or along France's border with Belgium, because the two countries had signed an alliance in 1920, by which the French army would operate in Belgium if the German forces invaded. After France failed to counter Germany's remilitarisation of the Rhineland, Belgium, thinking that France was not a reliable ally, abrogated the treaty in 1936 and declared neutrality. France quickly extended the Maginot Line along the Franco-Belgian border, but not to the standard of the rest of the line. As the water table in this region is high, there was the danger of underground passages getting flooded, which the designers of the line knew would be difficult and expensive to overcome. When the British Expeditionary Force landed in France in September 1939, they and the French reinforced and extended the Maginot line to the sea in a flurry of construction in 1939–1940 accompanied by general improvements all along the line. The final line was strongest around the industrial regions of Metz, Lauter and Alsace, while other areas were in comparison only weakly guarded. In contrast, the propaganda about the line made it appear far greater a construction than it was; illustrations showed multiple stories of interwoven passages, and even underground railyards and cinemas. This reassured Allied civilians. Czechoslovakia was also in fear of Hitler and began building its own defences. As an ally of France, they were able to get advice on the Maginot design and apply it to Czechoslovak border fortifications. The design of the casemates is similar to the ones found in the southern part of the Maginot Line, and photos of such are often confused with those of the Maginot. Following the Munich Agreement and the German occupation of Czechoslovakia, the Germans were able to use the Czech fortifications to study and plan attacks that proved very successful against the western fortifications, (the Belgian Fort Eben-Emael is the best known example). The World War II German invasion plan of 1940 (Sichelschnitt) was designed to deal with the line. A decoy force sat opposite the line while a second Army Group cut through the Low Countries of Belgium and the Netherlands, as well as through the Ardennes Forest, which lay north of the main French defences. Thus the Germans were able to avoid a direct assault on the Maginot Line by violating the neutrality of Belgium, Luxembourg and the Netherlands. Attacking on 10 May, German forces were well into France within five days and they continued to advance until 24 May, when they stopped near Dunkirk. During the advance to the English Channel, the Germans overran France's border defence with Belgium and several Maginot Forts in the Maubeuge area, whilst the Luftwaffe simply flew over it. On 19 May, the German 16th Army successfully captured petit ouvrage La Ferte (southeast of Sedan) after conducting a deliberate assault by combat engineers backed up by heavy artillery. The entire French crew of 107 soldiers was killed during the action. On 14 June 1940, the day Paris fell, the German 1st Army went over to the offensive in "Operation Tiger" and attacked the Maginot Line between St. Avold and Saarbrücken. The Germans then broke through the fortification line as defending French forces retreated southward. In the following days, infantry divisions of the 1st Army attacked fortifications on each side of the penetration; successfully capturing four petits ouvrages. The 1st Army also conducted two attacks against the Maginot Line further to the east in northern Alsace. One attack successfully broke through a weak section of the line in the Vosges Mountains, but a second attack was stopped by the French defenders near Wissembourg. On 15 June, infantry divisions of the German 7th Army attacked across the Rhine River in Operation "Small Bear", penetrating the defences and capturing the cities of Colmar and Strasbourg. By early June the German forces had cut off the line from the rest of France and the French government was making overtures for an armistice, which was signed on 22 June in Compiègne. As the line was surrounded, the German Army attacked a few ouvrages from the rear, but were unsuccessful in capturing any significant fortifications. The main fortifications of the line were still mostly intact, a number of commanders were prepared to hold out, and the Italian advance had been successfully contained. Nevertheless, Maxime Weygand signed the surrender instrument and the army was ordered out of their fortifications, to be taken to POW camps. When the Allied forces invaded in June 1944, the line, now held by German defenders, was again largely bypassed; fighting touched only portions of the fortifications near Metz and in northern Alsace towards the end of 1944. During the German offensive "Operation Nordwind" in January 1945, Maginot Line casemates and fortifications were utilized by Allied forces, especially in the region of Hatten-Rittershoffen, and some German units had been supplemented with flamethrower tanks in anticipation of this possibility. At one point during the fighting, General Martin, commander of the IX Corps, was ordered to advance from the Maginot Line against a German division, and consequently locked the concrete bunkers and left the keys with a colleague. When his fellow commander's unit was ordered south to reinforce French cities, Martin was forced to retreat from his attack and found himself pursued by a German tank division, and locked out of his own fortifications. He had to employ French engineers and sappers to break into the bunkers, which were subsequently overrun by the Germans. The view from a battery at Ouvrage Schoenenbourg in Alsace. A retractable turret is in the left foreground. After the war the line was re-manned by the French and underwent some modifications. With the rise of the French independent nuclear weapons by 1960 the line became an expensive anachronism. Some of the larger ouvrages were converted to command centres. When France withdrew from NATO's military component (in 1966) much of the line was abandoned, with the NATO facilities turned back over to French forces and the rest of it auctioned-off to the public or left to decay. A number of old fortifications have now been turned into wine cellars, a mushroom farm and even a disco. Besides that, a few private houses are built atop some of the blockhouses. Ouvrage Rochonvillers was retained by the French Army as a command centre into the 1990s, but has recently been closed. Ouvrage Hochwald is the only facility in the main line that remains in active service, as a hardened command facility for the French Air Force known as Drachenbronn Air Base. In 1968 when scouting locations for On Her Majesty's Secret Service, producer Harry Saltzman used his French contacts to gain permission to use portions of the Maginot Line as SPECTRE headquarters in the film. Saltzman provided art director Syd Cain with a tour of the complex, but Cain said that not only would the location be difficult to light and film inside, but that artificial sets could be constructed at the studios for a fraction of the cost. The idea was shelved. ↑ Chelminski, Rudolph (June 1997). "The Maginot Line". Smithsonian. pp. 90–100. Archived from the original on 2 December 2007. http://web.archive.org/web/20071202110359/http://www.dushkin.com/text-data/articles/23427/23427.pdf. Retrieved 26 June 2012. ↑ Kemp, Anthony (1988). The Maginot Line: Myth and Reality. Military Heritage Press (via Google Books). p. 14. ISBN 978-0-88029-243-6. http://books.google.com/books?id=CHvZAAAAMAAJ. Retrieved 26 April 2011. ↑ Gravett, Christopher (2007). The History of Castles: Fortifications Around the World. Globe Pequot (via Google Books). p. 187. ISBN 1599211106. http://books.google.com/books?id=1aUqG23Wm0kC. Retrieved 19 April 2013. ↑ Frieser, Karl-Heinz (2005). The Blitzkrieg Legend. Naval Institute Press. p. 88. ISBN 978-1-59114-294-2. ↑ There are 58 ouvrages, 311 casemates, 78 shelters, 14 observatories and around 4,000 blockhouses on the North-West and 84 ouvrages, 41 casemates, three observatories and around 1,000 blockhouses to the South-West. ↑ Seramour, Michaël. "Histoire de la Ligne Maginot de 1945 à nos jours" (in French). Revue Historique des Armées. pp. 86–97. http://rha.revues.org/index1933.html. Retrieved 19 February 2010. ↑ Chelminski, Rudolph (June 1997, abstract). "The Maginot Line – It Is Known as a Great Military Blunder, But in Fact This Stout Network of Ingenious Bunkers Did What It Was Designed to Do". Smithsonian. Retrieved 17 March 2013. Allcorn, William. The Maginot Line 1928–45. Oxford: Osprey Publishing, 2003. ISBN 1-84176-646-1. Kaufmann, J.E. and Kaufmann, H.W. Fortress France: The Maginot Line and French Defenses in World War II, Stackpole Books, 2006. ISBN 0-275-98345-5. Kaufmann, J.E., Kaufmann, H.W., Jancovič-Potočnik, A. and Lang, P. The Maginot Line: History and Guide, Pen and Sword, 2011. ISBN 978-1-84884-068-3. Romanych, Marc; Rupp, Martin. Maginot Line 1940: Battles on the French Frontier. Oxford: Osprey Publishing, 2010. ISBN 1-84176-646-1. Wikimedia Commons has media related to Maginot Line.